Getting a new credit or debit card can be exciting, especially if it is your first card. Unfortunately, some people are taking that excitement to Twitter in the form of pictures of the new credit or debit card. It sounds almost like a joke, but people really are taking photos of their new credit cards and debit cards and posting them on Twitter for the world to see. The good news is that some of those tweeters are getting the message. Not all, but some of the pictures that were retweeted by the @NeedADebitCard account have since been removed by the original poster. 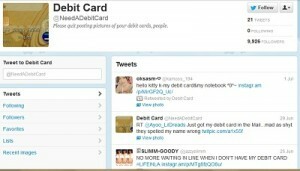 Hopefully the money clueless who posted the photos did not experience any fraudulent activity on the account.